the MomTog diaries: I've Been Tagged....Have You? Then tag four more people to do the same! 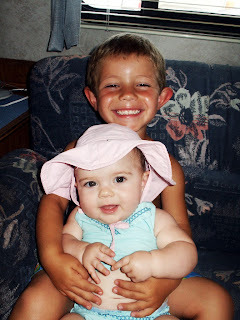 This photo was taken during our beach trip in August of 2006! Hayden was 3¾ yrs and Halle was 6½ mos! Little brownie and little whitey! Aren't they just too cute?!! I tag Katherine, Kelli, Ali, and Morgan! Tag...your IT! !